This wand is of standard size and it has a twisted barrel, which serves as a guide when curling. It also has a very handy cool tip, to make life easier and more likely to be burn-free! The swivel 2.5m cord is also very practical. What stroke me first was how quick it heats up; admittedly, I set it to the third (180) of the five temperature settings (the maximum is 210 degrees), to suit my hair texture. I separated a strand, rolled it in, held for about 10 seconds and unwrapped and the curls are well defined and symmetrical. I tend to put my waves lower in the head, instead of starting at the recommended 2in from scalp. Sometimes, if I am wearing extensions, I do them even lower. After doing the whole head, I let them cool down and brushed. A lot. And ended up with nice waves. Really nice waves. Basically, I really love the effect, with little effort. I used with L’Oréal Studio Line #TXT Wave Creating Spray. 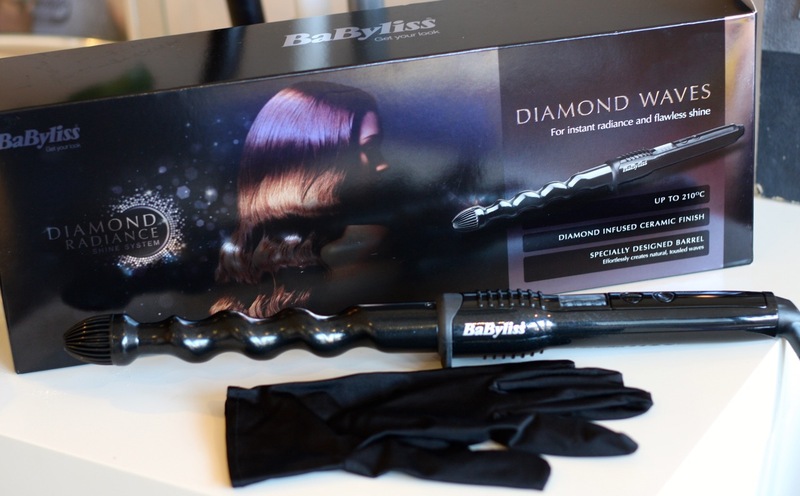 The BaByliss Diamond Waves Wand has a diamond infused ceramic finish barrel to help create smooth, shiny and soft styles. I have to say it didn’t fry my hair and the styles are smooth. Being the anxious type, I welcome the auto switch-off after 72 minutes! And it comes with a nice little glove to protect your hands while styling. The BaByliss Diamond Waves Wand sells for the amazing value of £29.95 from John Lewis. You can also find other Babyliss products, from this range and others, at John Lewis. It does a very decent job – quick and easy too – especially for the price!